What's happening at the Center: new reports, papers, podcasts, events, and more. Sign up for the CGR dstribution list. 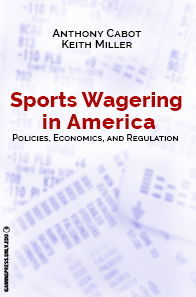 One recent book from the UNLV Gaming Press is a look at the laws and economics around sports betting in the United State. Learn more here or go directly to Amazon to buy a copy. Awarded since 2007 and renamed in honor of William R. Eadington in 2013, the Eadington Fellowships are intended to foster scholarship focused on gambling issues and to encourage the use of the rare and unique collections at the University of Nevada, Las Vegas. The 2018-9 application cycle is now open. Learn more on the Fellowships page. The Center for Gaming Research, inside UNLV's Lied Library, provides support for scholarly inquiry into all aspects of gambling, including the business of gaming, its economic and social impacts and its historical and cultural manifestations. For statistics by state, visit the Jurisdictions page. For historical information on gaming corporations, visit the Companies Page. The Reports page includes data on gaming at local, statewide, and national levels and a list of gambling-related dissertations, among other material. The Occasional Paper Series features more in-depth academic work, and the Podcast page includes recordings of lectures and interviews with gaming executives and scholars. To learn more about the Center's recent work, view the latest monthly update or visit the Update page. 45: Kim Manh. "Luck of the Land: The Growth of Tribal Gaming." 44: Kelli Wood. "A History of Play in Print: Board Games from the Renaissance to Milton Bradley." 43: Colleen O'Neill. "Civil Rights or Sovereignty Rights? Understanding the Historical Conflict between Native Americans and Organized Labor"
42: Massimo Leone. "Christianity and Gambling: An Introduction"
41: Cynthia Van Gilder and Dana Herrera. "Ninth Island, Las Vegas: Hawaiian Gaming Tourism and The California Hotel"
40: Mark Johnson. "Comparing the Professionalization of Pro Gamblers and Pro Video Game Players"
39: Paul Franke: "Of the Rat Pack, Ashtrays, Cocktail Napkins, and Grateful Losers: The Making of the Las Vegas Experience as a Historical Process in the 20th Century"